My mother. She died much too young for my children were too young to properly remember her. She died much too young, period. But that is not what this post is about. It is about who she was, in the hopes that my children will see how she influenced my life, and so they will get to know her a little bit. Mary Lou Melrose was the youngest of three daughters born to John and Emma (Robinson) Melrose. Emma came from a large family. John (“Jack”) was the youngest son of two boys; his older brother (the favorite) died in 1917 of “complications due to scarlet fever” (more on that at some other time). They were devout Baptists, and by “devout” I mean that my mother didn’t know what menses were until she was thirteen, sat on the toilet, and thought she was hemorrhaging and her mother was forced to tell her. The three girls were never as prudish as the mother; quite the opposite, in fact. Grandma never did approve of the drinking, and she never did approve of my father. Grandpa, however, enjoyed my father’s company and they often were “locked in the basement” by Grandma because they’d been drinking. Scandalous! 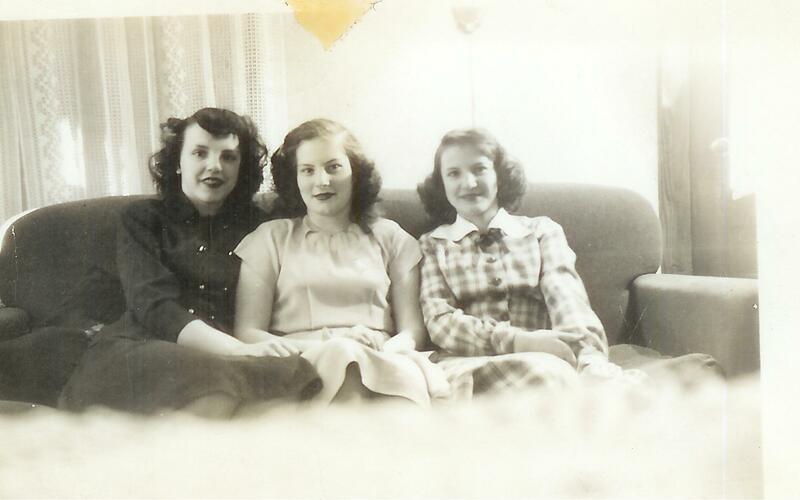 Aunt Donna (standing) is the middle child. Aunt Phyllis is the oldest. 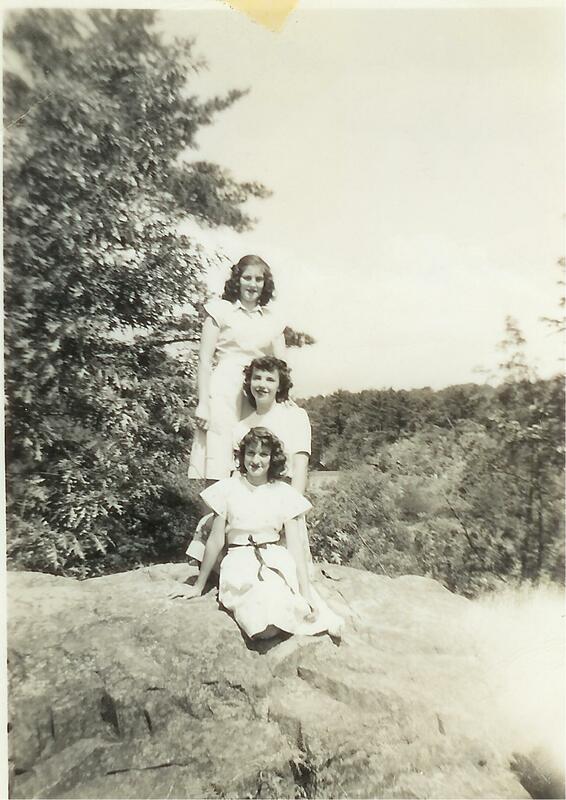 Mary Lou (front) was the youngest. This was taken when they journeyed from Wisconsin to the Oregon Coast (mid 1940’s). Mom never mentioned the reason for the trip, but two of the girls were so taken with the West Coast that they ended up spending their lives out here. Mom grew up in a podunk dot on the map called Rock Falls, Wisconsin, just south of Eau Claire. The windy road between Rock Falls and Eau Claire is pretty much the same today as it was then (better pavement and more Amish now). Melroses and Robinsons fill the cemetery at Rock Falls, along with such notables as Robert Browning (of Browning Rifles) and his dog. 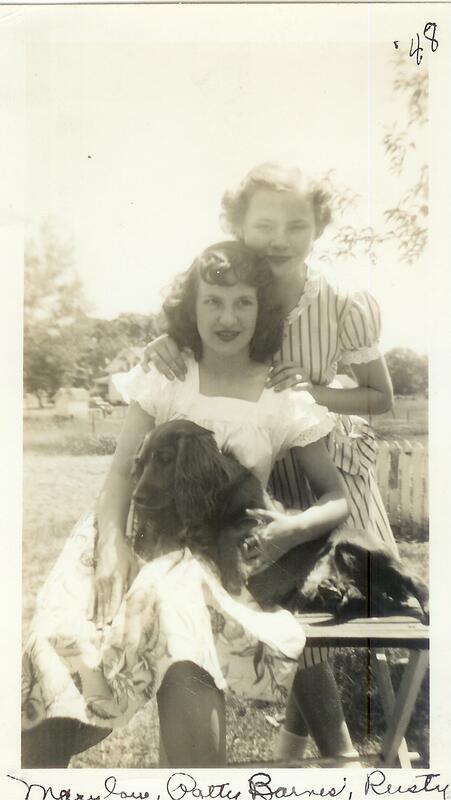 Mom loved dogs and hated chickens (and all caged birds, by association*) and horses**. I learned the story behind Rusty the dog (pictured above) when our own beloved Butchy died. It must have happened shortly after this photo was taken – Mom was still a girl, but old enough to remember the feelings. Rusty was hit by a car on the highway out front and died in her arms. **Mom told me this story in an effort to discourage me from loving horses so much. Or maybe it was just an honest confession when she sat on the bed in her room, my sister and I cuddled up to her, begging for stories from her childhood. She’d ridden a horse. Once. It was a friend’s horse, perhaps Pat’s horse (in the photo above). An old, dumpy, barn sour horse. It was fine, until it was Mom’s turn to ride it alone, and they happened to turn in the direction of the barn. The horse suddenly went from dumpy and old to something akin to War Admiral. Not only did its gait change from a tired walk to an all-out run for the money, it was headed for a clothesline that was right about neck level for my mother. She managed to bail before being decapitated, and only her ego was bruised, but – well, horses were purely evil in her mind. I have the same aversion to primates. They are purely evil. Mom was a born rebel. Her high school graduation paper was on “What I Want to do When I Grow Up.” Every other girl wrote about how they wanted to be typists, stenographers, mothers, nurses… Mom wrote about becoming a beach comber on the Oregon Coast. She got an “F”. She was also a follower and a little bit needy in her younger days. Aunt Phyllis married her best friend and beau. Mom married his best friend. Aunt Phyllis is still married to Uncle Bob. Mom divorced her husband before two years were out because he manipulated and (she never actually said it) abused her. I don’t know if it was verbal or physical. It was, however, the last time. She was an HSP, like me. Do.Not.Startle us. I learned this on an April Fool’s when my brother decided it would be smart to plug the exhaust pipe on Mom’s car with a potato. It’s supposed to be funny. Fortunately (for my brother) Dad caught him. Dad was even nice about it. “Son, you do NOT want to startle your mother. Trust me.” That was when we learned about the exploding cigarette. Mom was a secretary(civilian) for the U.S. Army at Camp Hanford, Washington. Dad was a regular there every other weekend, just paying his dues until the Army released him. I believe Mom was still married or in the throes of divorce. April Fools – Dad loaded Mom’s cigarettes with those little explosives that are supposed to startle and amuse. He had to take her home from work. She was hysterical. A basket case. I totally relate. Do.Not.Startle.Me. There’s so much more I could write about my mother here. She was the funniest person I have ever had the pleasure of knowing (“Look! A Lert!” mime a hunchback-creature) (Next to Lisa Thompson, only). She was the stubbornest person I have ever met (next to my brother. Or myself. Or… Myself). I knew this was going to have to be in parts when I started it. This is Part One, but i don’t know of how many parts. 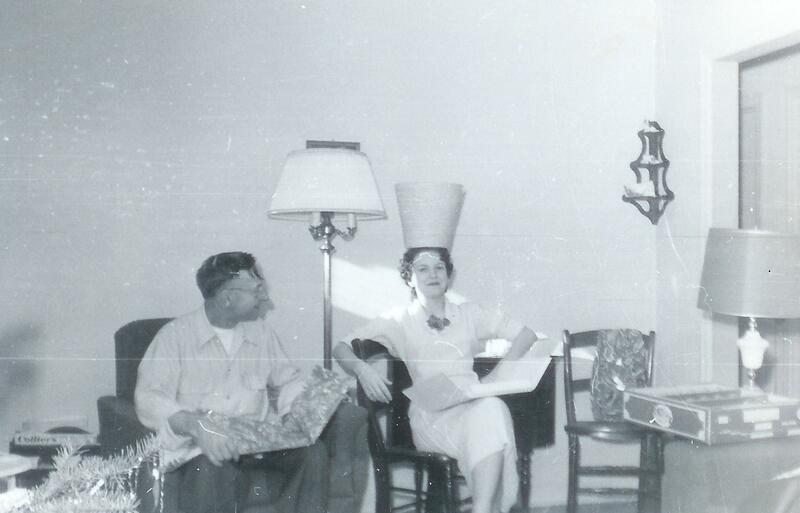 Not sure what is on her head, but… Yeah. That’s where I get it from.